This “little gem” close to down town has an out of town feel! 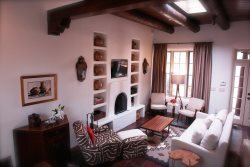 This is the quintessential indoor/outdoor living experience that everyone loves about Santa Fe. On the north of the house is a lovely grass area with covered patio for grilling and relaxing. On the south side of the house is a terraced yard that features an amazing view of the Sangres. It’s perfect for watching the mountain change colors while sipping an evening cocktail. As you walk in the front door, you enter the cozy living room with kiva fireplace. The bedrooms are located at each end of the house offering an extra bit of privacy for guests. The master has a lush king bed with a kiva fireplace and a regal mirrored dressing room that you pass through to the master bath. The perfectly appointed guest room has twin beds that can be made into a king. Enjoy a fully stocked, beautifully remodeled kitchen with stainless appliances and marble counter tops. The dining room table comfortably seats 6. Casa Poco Joya now offers a fully furnished and well equipped Detached Guest House Casita with 1 queen bed, one full bathroom, kitchenette and a gas kiva fireplace. The guest house is approximately 800 net square feet. The Guest House Casita is $150 a night in the Low Season (January to May 31) and $200 a night in the High Season (June, July and August), is $150 a night September, October, November and December 1-15. Holidays $200 a night. High End Kitchen - very well equipped! Mountain Views from Backyard Terrace Patio! Very helpful, efficient staff - willing to consider our request for price negotiation. Great experience - look forward to returning! I wanted to thank Todd for his help and for coming by to check on us when my daughter had to be transported to the hospital due to a medical emergency. Top-notch! We always enjoy our stay in your properties and look forward to our next trip.